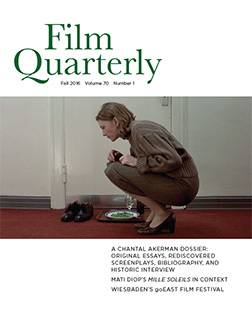 Assuming the editorship of Film Quarterly at a time when nearly every element of the medium of cinema is up for reinvention is no small burden. For those of us who love cinema and live by its precepts, happily, there’s as much reason to feel exalted as daunted by the transformations underway within and outside its domain. If we are living in a time of “film [sic],” a term I employ here in recognition of the extent to which the category itself has forsaken its fixity, it is more important than ever to affirm the characteristics that are essential and to analyze what is at stake, for gain and loss, in its current transformations. 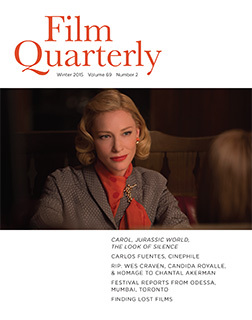 Of one thing I am certain: Film Quarterly has a crucial role to play. Since 1958, FQ has been a lodestone guiding the development and best ideas of an emergent field, discipline, and locus of attention. Its future calling can be no less. 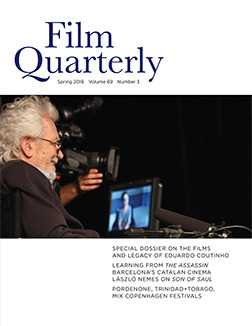 In this issue, we restore the FQ tradition of the dossier by devoting many of these pages not to the mainstream films heralded in the past but rather to a new independent film by the young filmmaker Joshua Oppenheimer. The Act of Killing, his investigation into the murders unleashed by the 1965–66 Indonesian coup as remembered by their perpetrators, premiered at the 2012 Telluride and Toronto film festivals and has attracted attention, awards, and debate ever since. Co-directed by Christine Cynn and an anonymous Indonesian collaborator, The Act of Killing will soon be followed by its companion piece that focuses centrally on survivors; see the dossier for details from the key writers and scholars invited here to consider the film’s meanings and contexts, and an interview delving into Oppenheimer’s own history and process. Also in this issue is an entirely different perspective on Indonesia, one provided by Pooja Rangan through her interview with filmmaker/scholar Fatimah Tobing Rony. Alongside a discussion of her book The Third Eye and her current research, Tobing Rony details her involvement in Perempuan Punya Cerita (Chants of Lotus), a collaborative film produced by Indonesian producer-director Nia Dinata to explore the underrepresented lives of Indonesian women. New FQ columnist Amelie Hastie debuts in this issue with an invocation of Dorothy Richardson, who wrote for the legendary journal Close Up at the moment cinema was transitioning from silent to sound technologies. Hastie focuses our attention on Sarah Polley’s Stories We Tell, one of the past year’s most deliriously inspiring films. Meanwhile, veteran FQ columnist Paul Julian Smith reports from Mexico City on new developments in popular cinema there. 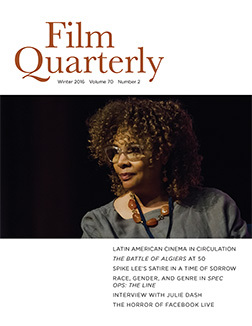 Film festivals continue to occupy a central position in FQ and this issue is no exception, with reports from the Courmayeur Noir In Festival in the Italian Alps, Mexico’s robustly emergent Morelia Film Festival, and dual coverage of this year’s edition of Sundance. Festival reports are essential to tracking new directions in filmmaking, but we hope to deepen FQ‘s involvement in film festival studies by considering their infrastructures, their role as live events in a time of diminished theatrical options, and the evolving nature of screens as festivals expand from solely theatrical venues into digital delivery and gallery display. Book reviews are a crucial element in any academic journal, and FQ maintains its commitment to tracking the literature of its field in its broadest contours. As the FQ website expands in scope, hopefully new modes of considering books, films, and debates will become possible. We look forward to engaging our readership more dynamically as citational practices evolve and as appropriate digital corollaries to publication are established. In the meantime, cinema continues to mutate. As of 2014, celluloid itself has definitively disappeared from movie theatres. The arrival of the DCP (Digital Cinema Package) era has caused movie theatres to undergo a severely disruptive moment that has seen many of them disappear. As an example of the extreme and muddled economics of this technological change, consider Project Drive-In, a website established by Honda to poll visitors (presumably Honda owners) for nominations of drive-in movie theatres in need of rescue, with a soundtrack that explains many “cannot afford the $80,000 digital projectors they need to stay in business.” The website boasts of nine “saved” by visitor contributions, but warns that 140 other drive-ins are in danger of closing. It’s unclear if Honda is contributing anything from its corporate coffers; further, with an interest bounded by automobile culture, its website expresses no interest in saving pedestrian theatres in similar crisis, though we know they desperately need saving, too. Outside the United States, the technology-precipitated crisis is equally dire. At Havana’s International Festival of New Latin American Film in December 2013, festival director Ivan Giroud placed quotation marks around every single word in the title of his panel on the New Latin American Cinema. Celebrating his festival’s thirty-fifth anniversary, he worried whether it could continue with only one DCP projector on loan from an ally. He was facing the disappearance of his entire access to new “film” in the future. What will become of Latin American cinema, Giroud asked, in the age of DCP? 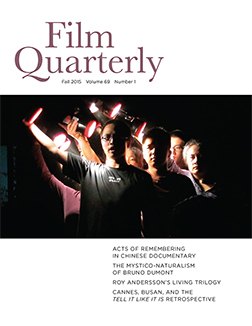 If this volume of Film Quarterly is the first of the post-celluloid era, it also marks a moment in which film is on the verge of becoming a generic term, a signifier devoid of any fixed category, gesturing instead toward a legacy of meaning. Simultaneously, it is a term under renewal, expanding instead of folding, annexing terrain from the digital to the mobile, swapping scale and utility for grandeur and ceremony, adapting as forcefully as its users demand. Signs of the times? Some film departments have changed their names to Screen Studies. The Toronto International Film Festival’s headquarters is called, not a theatre or multiplex, but rather: Bell Lightbox. Werner Herzog, never a purist, showed up online, where he filmed and narrated a Kickstarter video for organic salt and directed a PSA warning against texting while driving. In the new film order, representations hop and multiply across platforms with ease. Stars merge and morph from YouTube direct to cable, from bedrooms to television to cinemas to websites. Boxed sets, trailers, downloads, and remixes share space in an ever-expanding digital marketplace. It’s a brave new world in which platforms diverge and converge with such astonishing fluidity. Viewing practices are shifting radically, also, with the preservation of the “public” no longer guaranteed in a time of bit-torrent downloads and home entertainment systems that are moving the individual viewer further away from the theatrical experience, into a solitary activity more akin to reading a Kindle than the age-old ritual of assembling en masse in a venue to experience films collectively. Yet that’s the kind of access that many of us long dreamed of: a whole library of world cinema flowing into a household device. It’s the logical development of a move that started more than thirty years ago with the appearance of the first “video stores” in cities and malls, where membership opened up a world of cinema no longer regulated by the local movie-house. And then there’s television, the newest studio, the functional multiplex with a domestic address. In 2013, Steven Soderbergh celebrated his fiftieth birthday by announcing that he was retiring from directing films because “movies don’t matter anymore”—and announced his interest in making television instead. 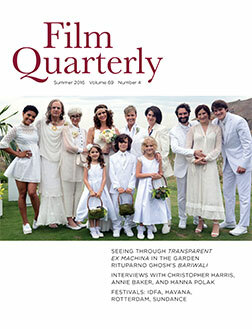 And last summer, the cineaste-identified Film Society of Lincoln Center staged a Breaking Bad marathon in its theaters, praising it as the “most cinematic of shows.” Television has emerged as the cinema of our moment, with its own auteurs, showrunners, and genres worthy of examination in the pages of FQ. It is not a matter simply of reviewing television, plumbing its depths of reference and association for meaning. Television addresses a fundamental shift in viewer habits and public consumption: the desire for the episodic, a refusal of the one whole organic object, the reliance on continuity and replicability into an uncertain but newly reassured existence. Further, new digital platforms have altered television’s seriality: now it’s possible to be immersed in marathon viewings that stitch together epics out of once-parsed chapters. Such new viewing habits affect the narrative power of television, and reset cinematic expectations. With Netflix, iTunes, and Amazon Prime as studio and distributor, an update is overdue. Some filmmakers have moved in another direction entirely: into the gallery and museum via installation works that are scrambling the codes of narrative and calling into question every detail from duration to spectator position. In fall 2013, Isaac Julien’s momentous nine-screen installation Ten Thousand Waves opened at the Museum of Modern Art in New York City, inhabiting its massive atrium from top to bottom and filling the museum with the sound of its ominous drums, as actresses Maggie Cheung and Zhao Tao spectacularly traded places on its giant screens. In an accompanying essay, none other than Laura Mulvey observed: “the structure of the installation precipitates the essay film into new aesthetic and theoretical dimensions.” Film installations need to be welcomed into the pages of FQ, and they will be, offering an opportunity to examine cinematic assumptions afresh. Archival practices are undergoing reinvention, too, both enabled and blocked by opportunistic technologies. On the one hand, the superb dedication of such entities as the Criterion Collection, Milestone Films, and Gartenberg Media Enterprises, to name key players, are making possible access to a wealth of cinematic history, ephemera, and value-added materials. Individual efforts, such as the Albanian Cinema Project (by FQ Associate Editor Regina Longo), democratize archival activities by pioneering transnational networks to enable the rescue of key cinematic patrimonies in a global context. At the United Nations itself in 2013, the discovery of a key archive of Palestinian films and photographs in poor storage conditions in Gaza and Jordan resulted in an urgent mission to preserve the unique collection. “The Long Journey,” an exhibition of resulting materials, is now slated to tour the Middle East and Europe, and to be made available to the public digitally through a website. While the emergence of crowd-funding options enables the public to participate in the realization of relaunches and rescues, at the same time, the disappearance of work from each successive technological platform constantly creates new crises of access. All options have to be continually interrogated and reconsidered. It’s a challenge to keep an accurate tally of the changes that we observe throughout the field, and perhaps that isn’t what matters most. Whatever “film” comes to mean, it is clear that FQ must do more than report on its objects and delivery systems: we have the chance to think through these shifts, analyze their effects, and provide guidance/signposts. And yes, to pay attention to the center of it all: film [sic]. The historical cannot be swept away by the contemporary: as each successive age remakes the past in its image and as each new turn of theoretical discovery opens unseen vistas, the need for scholarship devoted to historical cinema is undiminished. Texts and contexts drawn from the decades of cinematic practice will always be crucial to our understanding: they belong in FQ no less today than in earlier decades, when their primacy was more obvious. 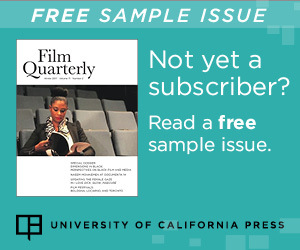 Film history and theory have always joined together with criticism in the pages of FQ. In the digital age, however, convergences of a different order are pending. As websites such as Fandor’s Keyframe have pioneered digital criticism that marches its texts and observations right through the scenes of films under discussion, so the challenge of what’s been called “digital humanities” has come to lap at the shore of film writing with ever more insistence and in advance of any disciplinary oversight. It is too early to know whether such expressions will be passing fads or entirely new approaches to knowledge-making, but they are already intriguing. At the same time, with criticism increasingly evicted from an ever-shrinking corpus of newspapers and with ever more bloggers competing loudly for attention, questions of value and hierarchy are crucial. What is today’s canon, and why? How is the emergence of cinephilia clarifying, or muddying, the view? Who gets to speak and claim objects of value, and why? With an online universe that’s increasingly gendered and racialized in ways quite different from the broader standards of cinema studies as it has evolved through the decades, these contours are important to mark. Whose film history is it, then? Surely we all have a stake in the answer. 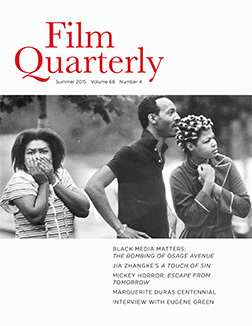 We believe Film Quarterly is vital to the debates and challenges of our age, and that its role is more important than ever. Please join us as we continue its vital enterprise. To quote our esteemed founder, the late Ernest Callenbach: Onward! Looking forward to reading FQ! Good luck on this new & exciting journey. The ‘film’ community, in all its new manifestations, is fortunate to have you!